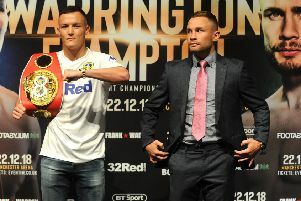 For two years Josh Warrington has been on the path to Carl Frampton’s door, step by patient step. After beating Patrick Hyland in 2016, Warrington and Hyland sat and drank Guinness in the early hours of the morning, watching Frampton win the WBA featherweight title against Leo Santa Cruz. The following January he was in Las Vegas to see Santa Cruz edge a tight rematch. That visit to the Strip, the city where the great, the good and the money-makers in boxing gravitate towards, made Warrington think and broadened his horizons. His professional career is a timeline of one achievement leading to another and of doors opening doors. The English title in 2012 became the IBF title in 2018 and a fighter who likes the home comforts of Leeds and Batley is starting to see Vegas as his next stage. He has Frampton and Manchester to deal with first, in a bout tonight which is under pressure to live up to its billing. Frank Warren, who promotes both boxers, made the contest a pay-per-view event in the belief that it would produce the fight of the year. Frampton beat Scott Quigg at Manchester Arena two years ago, a match-up which failed to deliver, but few people expect Warrington-Frampton to fizzle out in the same way. “It intrigues me as a fan,” said Michael Conlan, the super-bantamweight who appears on the undercard. 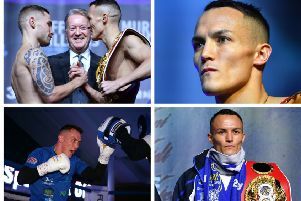 Warrington wanted the talented, aggressive Frampton seven months after winning the IBF featherweight belt from Lee Selby because at 28 he would rather not lose time to “steady defences”. Unification is on his mind and unification will be a realistic ambition if he fends off Frampton tomorrow. The other major nine-stone belts are held by an American and two Mexicans, including Santa Cruz. Warrington has already spoken of lining up WBO champion Oscar Valdez. A fight like that would almost certainly take place in America, and potentially in Las Vegas. Warrington is keen to tick an appearance on the Strip off his bucket list. “I was over there with my manager Steve Wood when Carl boxed Santa Cruz,” Warrington said. “We were on a bridge which goes over the Strip and I stopped to have a look down it. I could see Carl’s fans, the billboards for Frampton v Santa Cruz and buses driving past with the fight on them too. I thought ‘this is where I want to be’. Frampton’s loss to Santa Cruz is his only defeat in 27 bouts and the 31-year-old’s game, all-action style has earned him a huge following in his home city of Belfast and beyond. Warrington is an admirer of Frampton’s but, since elevating himself to an elite level, has also been a critic, analysing his style and identifying what he thinks are weaknesses in Frampton’s craft. Josh Warrinton and his father and trainer Sean O'Hagan. “When he lost (the rematch with Santa Cruz), I made a mental note of things I thought he was doing wrong when he was losing rounds. You start building it all up and you see habits. 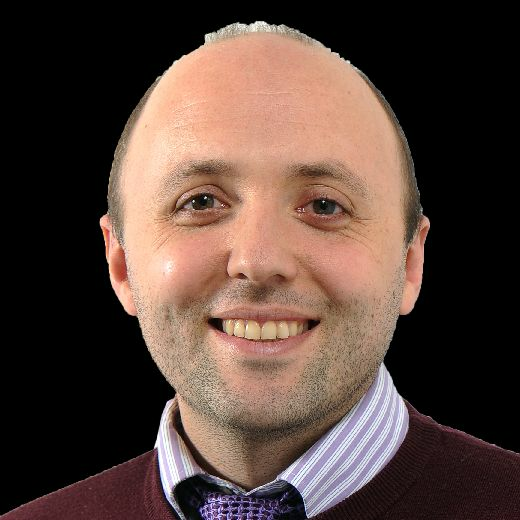 Frampton has a better rate of knockouts than Warrington although, as Warrington pointed out this week, only three of Frampton’s last 10 wins have finished inside the distance. Four of Warrington’s, including his victory over Dennis Ceylan last year, ended in a stoppage. Frampton battered Australia’s Luke Jackson in his most recent bout, leaving Jackson with two perforated ear-drums, but Warrington was unimpressed. “Luke Jackson – I don’t think he’d beat Dennis Ceylan,” Warrington said. “You’ve got to compare the two. Frampton, nonetheless, has the experience of six world title contests, four of them at super-bantamweight before he moved up to nine stone to take on Santa Cruz. Warrington’s first and only one came in May, when he out-pointed Selby brilliantly at Elland Road. That night was made for Warrington, in his home city, at the stadium of the football club he loves and with former Leeds United captain Lucas Radebe on the ringwalk. The club’s current captain, Liam Cooper, has the same honour in Manchester tonight. As Elland Road emptied and the dust settled, It was questionable whether Warrington would ever have the same experience again; the feeling of everything coming together so perfectly. Was there a danger of him thinking it could get no better? “That was it’s own chapter,” Warrington insisted. “Lee Selby, Elland Road, that was its own chapter and we start a new one now with Frampton in Manchester. After that there’ll be another one Stateside. Fight by fight, the trappings have become more lucrative and high profile and they will go through the roof if he scalps Frampton seven months after bludgeoning Selby. Few pundits tipped Warrington to beat Selby and relatively few fancy him against Frampton but the trend throughout Warrington’s 27 contests is of a fighter raising his standard whenever anyone asks him to. “In my head I made myself think that Selby was a monster,” Warrington said. “More skillful than Mayweather, better reactions than Lomachenko, a bigger puncher than Golovkin. Frampton is yet to rattle that conviction.